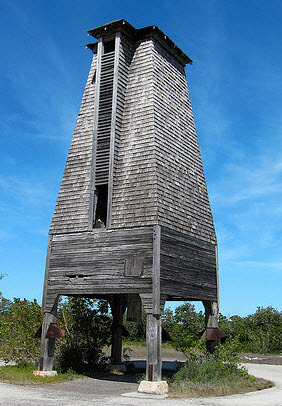 Perkys Bat Tower is as much a part of Florida Keys' history as key lime pie and Flagler's Overseas Railway, but I suppose just a little bit stranger. There are some people in life who deserve a reward. Not that they did anything brilliant. More to the point that they were a bit “nutty” and failed spectacularly, but in their own way memorably. One such person was Richter Clyde Perky, a fish lodge owner who was very keen on starting a resort in the Florida Keys. He knew where he wanted to build it, and went and researched the area closely. Whilst he was there he realised that his plans might be ruined by the mosquitoes that buzzed around him all the time, and of course left him red raw with bites all the time. After a bit more research he discovered that mosquitoes were a delicacy for bats, and if he could find enough bats then goodbye mosquitoes, hello resort, and HELLLOOOO CASH!! So he started building a uniquely designed, louvered pine tower that he planned to fill up with bat goodies, therefore attracting lots of bats that for good measure would eat the mosquitoes. Not a bat was to be seen, so the tower ended up as a lonely edifice to one man’s dream. Richter Perky did have one more go and ordered a load of bats to be delivered, but upon releasing them they just flew up and away and were never seen again. The one strange thing is that the tower must have been built extremely well, as it has withstood countless hurricanes over the years. Perhaps Perky should have called it a “Hurricane Tower” and he would be held in higher esteem than he is now. If you want to go and see the strange attraction then Drive along the Overseas Highway until you reach Mile Marker 17. Look for the rusty airplane on the side of the road near the sign reading Sugarloaf Airport. Drive straight for approximately .5 miles.